All TCB Pizza Delivery Bags feature our incredibly rugged, easy to clean Dura liner, nylon binding, steam vents, genuine Velcro closure and clear delivery ticket window. PK-316 Holds 2 ea. 14" Pizzas 16" x 16" x 6"
PK-318 Holds 2 ea. 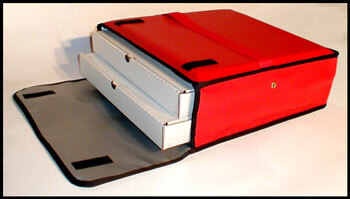 15" Pizzas 18" x 18" x 6"
PK-320 Holds 2 ea. 28" Pizzas 20" x 20" x 6"
PK-322 Holds 2 ea. 20" Pizzas 22" x 22" x 6"
PK-3518 Holds 5 ea. 16" Pizzas 18" x 18" x 12"
PK-3520 Holds 5 ea. 18" Pizzas 20" x 20" x 12"
Ideal for School Lunch Programs & Parties! Ideal for those businesses just starting out. Buy just 1 or buy 100!